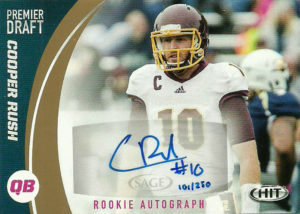 Cooper Rush played college football for Central Michigan. There for the Chippewas, Cooper passed for3,848 yards, 25 touchdowns, 11 interceptions, on an impressive 66.3 completion percentage in 2015, earning him second team All-MAC. His numbers slipped in 2016 to 3,540 passing yards, 23 touchdowns and 16 interceptions, and a 59.8 completion percentage. Still it was a good enough effort on Cooper’s part to earn 3rd team All-MAC. Starting all but 3 games over his time at CMU, Cooper just finished 12 yards shy of Dan LeFevour’s school career passing record. An intelligent quarterback with a quick read, timing, and accuracy, Cooper was a team captain during his Junior and Senior seasons. The big knock on Cooper is that he is just not a well-defined athlete. He completely failed the meat market eye test, and his arm strength was questionable at best. Cooper was not selected in the 2017 NFL draft. With the ‘retirement’ of Tony Romo, the Dallas Cowboys were looking for a quarterback late in the 2017 NFL draft to develop. Unable to find a project they liked, management elected to make Cooper a priority free agent signing. It makes sense as pre-draft, Cooper was compared to Cowboys second string quarterback Kellen Moore. In the meantime, the Cowboys can groom Cooper as a camp arm or practice squad guy until they get him up to the speed of the pro game.